Are you looking for a substitute for your traditional water heater? Harry Clark Plumbing is more than happy to address your water heating needs. We have a variety of models to choose from and our team is committed to helping you find the best option for your home. The first step in choosing right model for your home is to understand the differences between the varieties. A traditional water heater, often referred to as a boiler, can only hold a certain amount of water which limits the amount of hot water available to you at one time. Additionally, it is designed to keep the water heated so that it is available when you want it. This sounds convenient, but the drawback is that since the tank only holds a certain amount of water, once it's gone, so is your hot water source for a time while it refills and heats again. This uses a considerable amount of energy. The larger the capacity of the tank, the more energy it uses to fill and stay hot until you need it. There are many advantages to having a tankless water heater verses having a traditional water heater. A tankless water heater merely heats the water when you need it. Instead of using a tremendous amount of energy to keep the water heated around the clock, a tankless heater heats the water on demand. This means that you have a truly endless supply of hot water. Since this style of water heater doesn't require a big bulky tank to hold hot water, you also save space. The compact design is highly efficient and reduces energy usage. The longevity of a tankless water heater is about 20 years which is just about double the life expectancy of a traditional hot water heater. At Harry Clark Plumbing and Heating Inc.we offer a few different tankless water heater brands. We carry the Rheem, Takagi & Eternal brands. 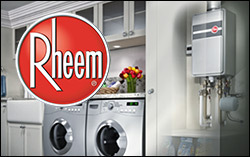 Tankless Water Heaters from Rheem are innovative, energy efficient water heating solutions for today's homes. 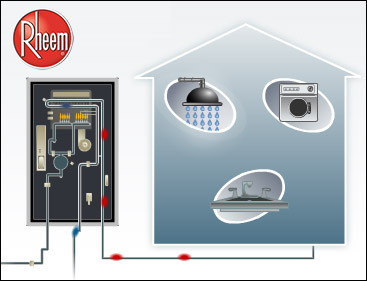 From point of use applications to whole home systems, Rheem has the water heating solution to fit your needs while providing a continuous supply of hot water from an energy-efficient and space-saving product. Imagine never running out of hot water again. 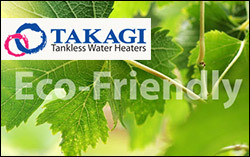 As the first tankless water heater company to enter the North American market 15 years ago and over half a century in Japan, Takagi has earned the reputation for developing superior tankless products with superior tankless technology. With that said, they know tankless and we know it well. 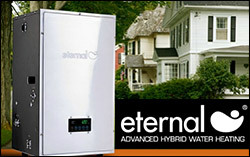 Eternal is the first to combine tank and tankless hot water heater features to create a consistent water heating system. Capable of supplying nearly instant and endless hot water, the original units launched in 2006 and now has over 2 million days of combined usage. Furthermore, the next generation Eternal Condensing Hybrid is the only gas hybrid water heater to be listed with Energy Star. For more information about tankless water heaters, or to schedule a consultation, give us a call today.